Los Pisos offers rustic cabin tent camping at our most remote site, deep in the beautiful Sierra Cacachilas mountains. On a north facing ridge, the Los Pisos campsite offers expansive views of land and sea and serves as our gateway to the eastern cape. Nearby trails ranging from easy to difficult lead down to the Sea of Cortez or deeper into the Cacachilas mountains. From here, you can hike as far as Rancho Las Cruces, La Paz and El Sargento — or simply relax and enjoy the natural surroundings and nearby points of interest. In this peaceful setting, guests are offered basic yet comfortable camping accommodations, home cooked food and clean, safe drinking water. Simply furnished cabin tents are left in place for a season. Our chefs prepare meals using ranch products and garden produce (as much as possible) in an outdoor kitchen area. The traditional kitchen was built in the historical manner combining carrizo (a bamboo-like reed) and mud. Dining is outdoors with a nearby fire pit and views of the sea, sierra and stars. 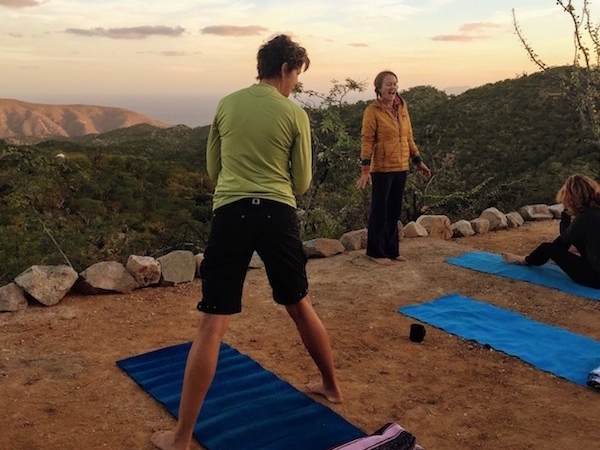 Our earthen yoga space overlooks the vast landscape and lends itself naturally for sunrise sessions. One of the nearby trails — the Mandala — leads guests on an easy loop by three springs, including the Pisos Spring that supplies us with water in even the driest months. Graced with a sculpture of a reclining buddha, the source makes for a relaxing spot to sit and gather one's thoughts or simply appreciate the surrounding silence broken only by bird song, cowbells and the wind. Enjoy your stay at Los Pisos for $200 USD per person per night in our Cabin Tents. Minimum 2 night stay. Minimum 6 guests. Los Pisos, which means the floors in English, owes its name to the many floors and foundations that were previously found in this location, dating back to the 1800s. This is the site of the old mining town of Cacachilas, which was once inhabited by approximately 200 people from various countries and walks of life. Here we continue to catch glimpses of the past in the form of glass bottles, ceramic pieces and slag from the inefficient processing that took place. Additionally, Los Pisos was a favorite resting and camping site of a locally famous cowboy named Don Victor, also known as Don Diablo. Here he kept supplies such as pots, pans, water, a jacket and even coffee. Spending the majority of his life in these mountains, he was an invaluable resource to us. Don Victor knew our lands very well and his deerskin coat hung on a tree here many years after he was gone. Learn more about his story on our Don Diablo Trail Run website. This annual running race starts in the outskirts of La Paz, crosses the Cacachilas mountain range, passes Los Pisos, and ends on a beach in El Sargento.